I am yet to come across a Charlotte Tilbury product I dislike. I am SO obsessed with her products that I just want everything in multiples, thank you! I was thrilled to find a couple of Nocturnal Cat Eyes To Hypnotise products in my Charlotte Tilbury Advent Calendar 2015, reviewed here. The Nocturnal Cat Eyes To Hypnotise sets contain an eyeshadow and a complementing eyeliner - all you need for a complete eye makeup look. I received the eyeshadow in the shade On The Prowl, and Rock 'N' Kohl Iconic Liquid Eye Pencil in Supernova. Since these came in the Advent Calendar, I did not get the external box that comes with the Nocturnal Cat Eyes set. Scroll down for review, swatches and eye makeup looks using Charlotte Tilbury Nocturnal Cat Eyes To Hypnotise On The Prowl. The Nocturnal Cat Eyes To Hypnotise are eyeshadows that work on their own without separate crease/blending/transitional shades, because of the colour shift, though they also pair up beautifully with ivory or gold highlighter shades. There are four of these duos in the range and each set costs £29. On The Prowl is described as an "antique aubergine" by Charlotte Tilbury. 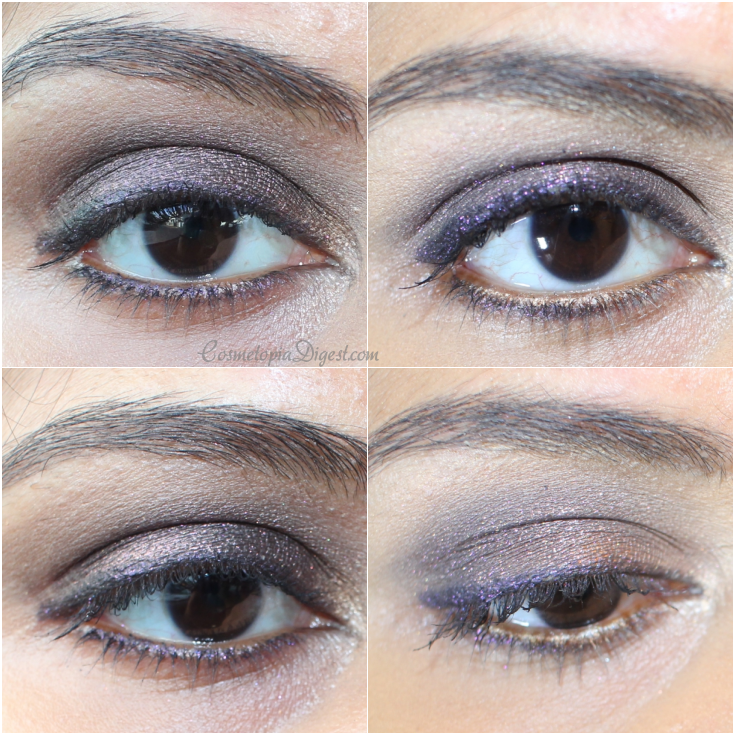 It goes straight from purple to plum-taupe to taupe with gold flecks to smoky brown. To know just how evident the shifts in the colour are, you have to see the swatches in varying sunlight conditions. The top left is in indoor light; the others (clockwise) are in direct sunlight - in the morning, noon and late evening sunlight respectively. All on bare skin, no primer. Pigmentation, as you can see, is as great as you could wish for. Sadly, the embossed design disappears once you dig your brush in a few times. From the look of the pan, I had expected the eyeshadow to be glossy-dry, rather like dried varnish. Contrary, this was lovely and smooth and an absolute dream to blend BUT it had little fallout or creasing. If I had to compile a list of powder eyeshadows with minimal fallout, this would be right there. I also love the eyeliner. CT describes Supernova as a "smoky plum" and that is pretty much what it is. You know what I usually say about pencil liners. This one is a keeper. It is not the creamiest out there, which suits me fine - very creamy eyeliner + oily lids = clown. 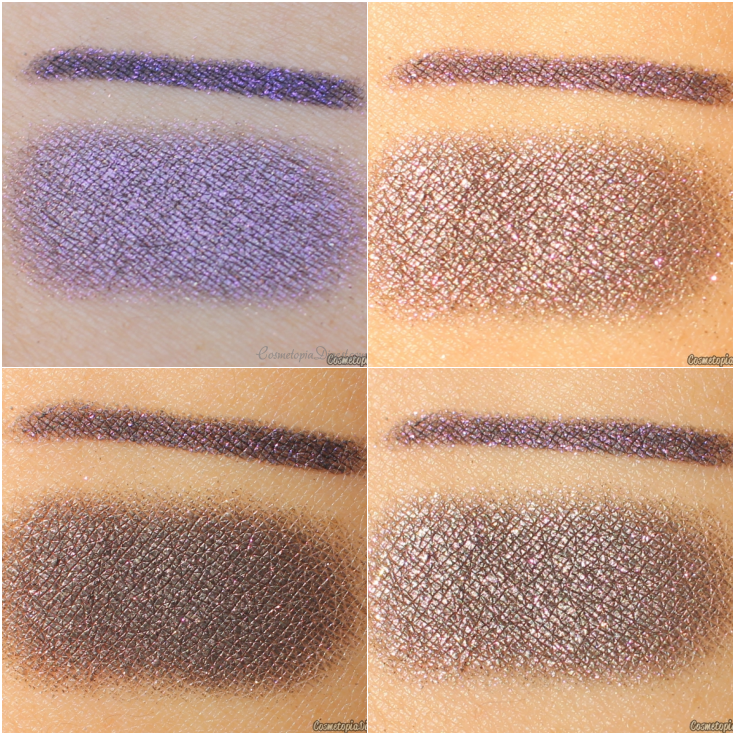 Supernova shifts in colour, but more subtly than the eyeshadow. My only gripe is, you need a sharpener and I'm bad at finding them, despite owning at least half a dozen. The ones on the left side are without using any other eyeshadow, in natural light. The ones on the right side are with Nudestix Magnetic Eye Colour in Gilt in the inner corners and lower lashline, indoor light. I love that you only need one eyeshadow and one eyeliner for a complete eye makeup look and you don't have to bother with crease colours, highlighters and so on. The shift allows this shade to work on its own. Best of all - little fallout. It was very easy to blend this out using Wayne Goss Brush 19. The Charlotte Tilbury Nocturnal Cat Eyes in On The Prowl was my go-to during the Holiday season. I want all four of these sets - they are also perfect for travelling since you only need one shadow for a look. These cost £29 in the UK or $39 in the US. You can buy this set or others in the range from Charlotte Tilbury here or Nordstrom here. Selfridges ships them - and a tonne of other goodies - worldwide, as also Net-a-Porter. Love or hate Charlotte Tilbury makeup? Tell me in the Disqus comments widget below.